The All Progressives Congress (APC) yesterday came down heavy on Chairman of the Presidential Advisory Committee on Anti-corruption (PACAC), Professor Itse Sagay (SAN) for describing it as “the most unprincipled group of people who are “encouraging and accepting rogues” in the party. 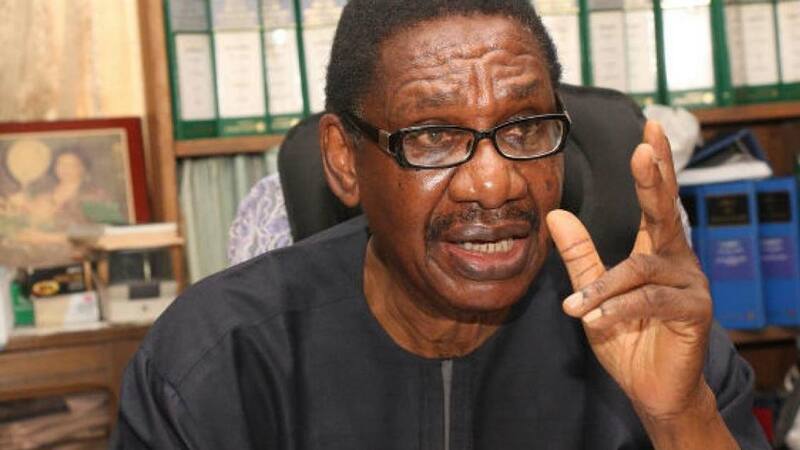 The ruling All Progressives Congress (APC) yesterday knocked The Chairman of the Presidential Advisory Committee on Anti-corruption (PACAC), Professor Itse Sagay (SAN) for describing it as “the most unprincipled group of people who are “encouraging and accepting rogues” in the party. But the APC, in a statement in Abuja by its National Publicity Secretary, Malam Bolaji Abdullahi, likened the remarks to the conduct of a “a quintessential rogue elephant behaviour.” It also accused Sagay of displaying arrogance and contempt for everyone but himself. The APC spokesman said, “In the said interview, Sagay described the leadership of the APC as “the most unprincipled group of people” who are “encouraging and accepting rogues” in the party. Abdullahi added, “The Webster Dictionary defines rogue elephant as ‘one whose behaviour resembles that of a rogue elephant in being aberrant or independent’. The statement added, “In his sheer arrogance, he forgets that it is impossible for him to call out the leadership of the party as ‘weak’ and ‘unprincipled’ without indicting the President, who is the leader of the party and has the fundamental responsibility to build the party. “If Sagay had any iota of respect for the man who dug him back from inevitable oblivion and put him in a position in which he now feels superior to everyone, he would channel his opinions and advice to the President on how to make the party stronger and more principled. The party reminded Sagay and all other appointees of government that the only reason they occupied their current positions today was because the APC won the 2015 elections. In his reaction, Sagay said he was an accomplished man long before any appointment, describing his attackers as ‘‘come and chop’’ politicians. The senior advocate added that his loyalty was to the President and not to the party which he believed had continued to fail under the leadership of Chief John Odigie-Oyegun. He said, “To start with, I am not a ‘come and chop’ person as they are. I did not come to ‘chop’; so they are not doing me a favour. They are the ones that come to ‘chop’. “I took this job because of Buhari and Osinbajo, who I admire greatly. The people I am referring to in my criticism are John Odigie-Oyegun and one Bolaji Abdullahi, who is (Senate President Bukola) Saraki’s Man. They are dining with the devil who wants to destroy the party.